LA RICHARDIE, ARMAND DE (the name also appears as Richardie), priest, Jesuit missionary; b. 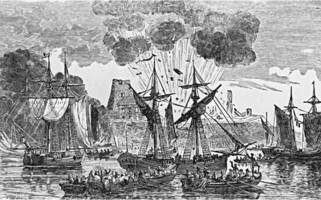 4 Jan. 1686 at Périgueux, France; d. 17 March 1758 at Quebec. Armand de La Richardie entered the Society of Jesus at Bordeaux on 4 Oct. 1703. He studied at various centres in France and taught at La Rochelle, Luçon, and Saintes (dept. of Charente-Maritime). Following his ordination in 1719, he was an instructor at Angoulême until his departure for Canada six years later. After his arrival in the colony in 1725, he spent some time at the mission of Lorette (near Quebec) learning the Huron language. Then in 1728 he journeyed to Detroit to establish the mission of Notre-Dame-de-l’Assomption among the Hurons. 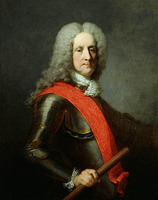 The governor, Charles de Beauharnois, called him well fitted to carry on the mission, but La Richardie’s initial apostolic labours were frustrating. In 1702–3, despite the opposition of Father Étienne de Carheil*, the Hurons had accepted the invitation of Cadillac [Laumet*] to leave the Jesuit mission on the Straits of Mackinac and settle at Detroit. There for a quarter of a century their spiritual needs had been attended to, if at all, by the Recollet chaplain Constantin Delhalle* and his successors at the nearby fort. The Indians had drifted away from Christianity. Eventually, however, La Richardie’s patient devotion was rewarded. Hoosiens, a chief, was converted and his kindred followed his example until by 1735 there were 600 neophyte Christians. 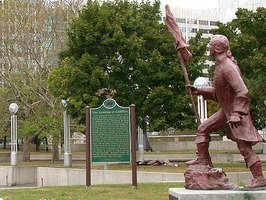 The progress of the mission was set back when the Hurons incurred the wrath of the Ottawas, Potawatomis, and Ojibwas of Detroit by warning their enemies the Flatheads of an impending raid. Fearing retaliation, a large number of La Richardie’s converts remained at their winter hunting quarters near Sandoské (Sandusky) and made only occasional visits to Detroit. They begged Beauharnois to move them near Montreal, but La Richardie opposed the move, partly from fear that they would be settled at the Sulpician mission of Lac-des-Deux-Montagnes. Attempting to reunite his flock, in 1742 he transferred the mission some 20 miles downstream from the fort to Bois Blanc Island at the mouth of the Detroit River. The change was accepted by all except one faction led by Orontony (Nicolas). The strain of his life led the weary Jesuit to ask for relief from his responsibilities. In the summer of 1743 Nicolas Degonnor came to replace him, but sickness forced Degonnor to return to Quebec the next year. In September 1744, Pierre Potier* arrived to understudy the mission’s founder. His coming proved timely, for in the spring of 1746 La Richardie suffered a stroke and at the end of July returned to Canada for a rest cure. His retirement was short. The following May some disaffected Hurons and other Indians from Sandoské, inspired by the English it was said, destroyed the mission. The Christian Hurons appealed for the return of the missionary whom they had learned to love and revere as a father, and in October La Richardie arrived in Detroit. With the aid of a grant of 5,000 livres from the government, in 1748 he re-established the mission at La Pointe de Montréal (in the present city of Windsor). Having completed the reconstruction and made renewed efforts to bring back to the fold the scattered remnants around Sandoské, La Richardie returned to Quebec in summer 1751. During his retirement he became vice-superior of the Jesuit college (1755) and spiritual director and confessor at the Hôtel-Dieu monastery (1756). He also served as a confessor at the college until his death in 1758. ARSI, Gallia 110/II, ff.348–49. ASJCF, mss Potier, La gazette du père Potier. DPL, Burton hist. coll., Potier papers, Livre de compte de la mission des Hurons du Détroit, 1733–91. “Cadillac papers,” Michigan Pioneer Coll., XXXIV (1904), 49–51, 63. JR (Thwaites), LXVIII, LXIX. Windsor border region (Lajeunesse). Casgrain, Histoire de ľ Hôtel-Dieu de Québec, 574. George Paré, The Catholic Church in Detroit, 1701–1888 (Detroit, 1951). Rochemonteix, Les Jésuites et la N.-F. au XVIIIe siècle, II, 36, 56. W. E. Shiels, “The Jesuits in Ohio in the eighteenth century,” Mid-America (Chicago), XVIII (1936; new ser., VII), 27–47. E. J. Lajeunesse, “LA RICHARDIE, ARMAND DE,” in Dictionary of Canadian Biography, vol. 3, University of Toronto/Université Laval, 2003–, accessed April 24, 2019, http://www.biographi.ca/en/bio/la_richardie_armand_de_3E.html.